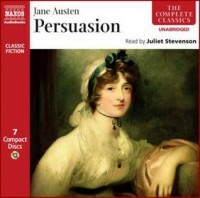 I read "Persuasion" on a wave of enthusiasm for Jane Austen created by reading "The Jane Austen Project". I'd never read the book before and knew nothing of its plot or its ending. I found that this ignorance significantly enhanced my enjoyment of this book about lovers frustrated by circumstance and the things that they have persuaded themselves of or have been persuaded of by well-meaning advisors.. I listened to the audiobook version read by Juliet Stevenson who delivered every line with an ease and confidence that made the whole book at once easily accessible and tantalisingly complex. The clarity of the language, the dryness of the wit and the unhurried pace of the book all added to my enjoyment. I was surprised at the vigour of the social commentary in the book. The vain and incompetent Baronet, who takes pride in looks he has convinced himself are not declining year by year and a rank he gained by birth but lacks the acumen to sustain in life is practically vivisected in the text, even though he is the father of the mild-mannered main character. There is also a spirited championing of the capabilities of women and the role that men play in disadvantaging the development and use of those capabilities. Some of the novel is set in Bath, a city I lived in for many years, so I was amused to see references to streets that apart from the addition of traffic signs and double yellow lines, have remained unaltered since Jane Austen's time. I used to live in the building occupied by the baddy of the plot. It was great fun to imagine these familiar streets populated by Regency sailors and a ladies so unused to exercise and so bound up in corsets that walking up Milsom Street was an achievement. The story itself is rather unremarkable but achieves a considerable level of engagement in the lives of the protagonists for a plot built on so slight a premise. I enjoyed myself immensely and am now encouraged to move on to the rather more substantial "Emma".